I like this! Nice twist. Yes, it’s always those closeted conservatives that surprise us. Good job, my friend. Linda! Welcome to The Jaded Lens. I appreciate you stopping by. 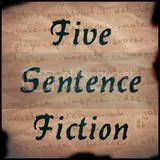 I have had so much fun with Lillie’s “Five Sentence Fiction” and I wholeheartedly encourage you to give it a whirl! Britton- I love this piece. did not expect that ending but it made my heart feel good. well done. Reading along I wondered if you’d spoken to my sons about their dad and then I came to the end and couldn’t help laughing. Never in a million words for him but for this man and this son a wonderful turnaround. Love it! Wow! I didn’t see that coming. I love it. Do you ever submit these to the short short contests? Also, I could sit and read a whole collection of these. Wonderful. Thank you Elisabeth. I’ve never submitted any of my writing to a contest…perhaps I should be more bold! I appreciate the encouragement. The title — with all the metaphor it holds — had me thinking I was in for a surprise. Indeed a got one. Denial, that most surprising of conditions.